Acres of unclosed tabs, a hundred things I meant to post, all sorts of emails in on the FAQ line, and I never even got to post all the links to Neil Gaiman coffees and things. Argh. For the first time in 8 years, I just found myself wishing, for a moment, that I had enough time to blog properly. Or a deranged hunchbacked lab assistant to blog for me. I was wondering if you know of ways the public could win/buy tickets to be there, and if you were doing anything else in Toronto while you're here. I asked, but I think all the tickets have been given out. If there are any spares and any way to get them out on Monday, I'll Twitter it. One Actress (Miss Fairuza Balk). To make identifying the people in the picture more difficult, I have muddled up the order. 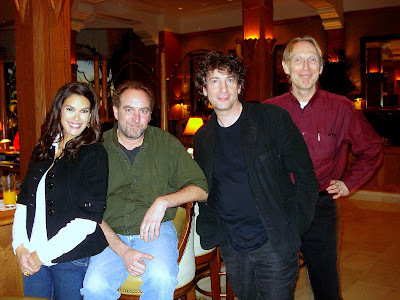 I will tell you though that the director (Mr Henry Selick) is taller than anyone else in the picture, and the actress (Miss Fairuza Balk) has the amazing smile. And that I (the author) am wearing what I like to think of as my Hungarian waiter's jacket, and am the one who needed the red-eye fix. I'm in a hotel suite doing interviews. Can I point to http://news.shelf-awareness.com/nview.jsp?appid=411&j=618968#2682175? It's an interview done with me in the cab on the way to the airport yesterday. Also, I announced it on the Today show, and confirmed it on Twitter, but not here -- yes, Neil Jordan will be writing and directing The Graveyard Book film. So many messages it's impossible to pick through them or answer them all. (I read them all though. )Am still whirling in a tornado of amazing. I heard a rumour somewhere that you might be appearing at the Dublin Film Festival screening of Coraline. Is this true? Because it would be pretty awesome to have you there. Yup. I'll be there. There will probably be an intro and a Q&A to go along with it. More soon. Off to airport for LA round two. Long long day. All interviews, pretty much. Here's a iPhone photo by my publicist from HarperChildren, Elyse Marshall, of me twittering on my G1, taken without me knowing. http://www.msnbc.msn.com/id/28857583/ has my TODAY Show appearance this morning. http://www.npr.org/templates/story/story.php?storyId=99914750 is the Talk of the Nation appearance I did. 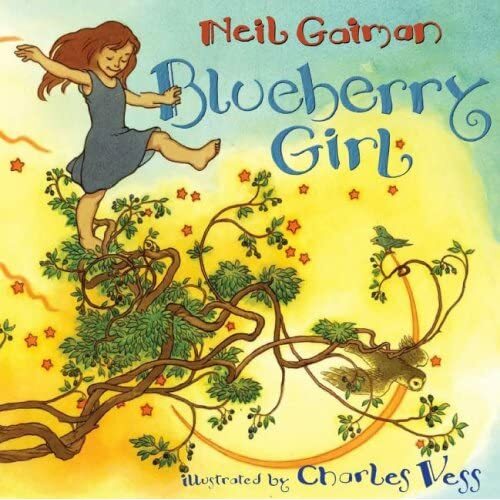 http://www.guardian.co.uk/books/booksblog/2009/jan/27/neil-gaiman-newbery-medal-controversy is a great little article from the Guardian Books blog about the Newbery and me winning it, and any controversies currently arising from such. For all the congratulations and the kind wishes, thank you all, so much. Then I got a phone call from Elyse, Harperchildren publicist, wanting to know if I could fly in from LA to New York to be on the Today Show tomorrow morning. I said sure. I mean, what else was I going to say? So I'm checking out of this hotel two days early, and I'm typing this with the ALA webcast playing in the background. They haven't got to the Newbury award yet. I'm not sure that they're actually going to say The Graveyard Book when they get to the Newberies bit. I might have imagined all of this, or they may have to do a sudden recount or something. But I think it probably happened. I mean, it's now 7:20 am and I'm drinking tea and blinking happily at the world. Spoke to Holly. Spoke to Mike. Okay. They just said it. I can post this. Is Coraline right for (insert age here)? I was wondering in your opinion if this film would be too scary for 6 years old. ...and the only real reply I can give, is that it's a bit like saying "I'm planning to cook a mushroom omelette tomorrow, and do you feel this food would be welcomed by a six year old?" Answer: I don't know. I don't know your six year old. They tend to like different things and respond differently. Does your six year old like mushrooms or omelettes? And the answer to is Coraline right for six year olds is, I don't know. What sort of thing does your six year old like? I think a good rule of thumb would be, that if your child can cope with The Nightmare Before Christmas and the original Wizard of Oz then they should be able to cope with Coraline just fine. As a general rule, Coraline the book is much creepier for adults than it is for kids, who tend to read it as an adventure. I suspect that this will be true of the film as well. This is the sort of post that normally I say something about how tired I am and apologise for not posting anything, because by the time I get to blog, I am braindead. 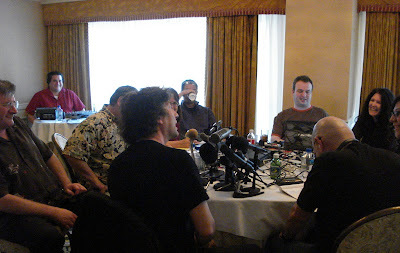 It was the International Press Junket for Coraline. And while I am completely frazzled and braindead and hoping that room service will come while I am still awake, I am also happy that I can point to http://twitter.com/neilhimself for today, and to the blog of my ultracompetent assistant Cat Mihos (who took the above photo of me during my three minutes of grooming) at http://kittysneverwear.blogspot.com/2009/01/coraline-press-junket-part-1.html to tell you what happened. Room service just came. I eat then sleep now. In Just Seven Days I Can Make You A Man With A Dog. This is what the Carrying a Convalescent Dog Up and Down Stairs Workout Plan looks like. Truth to tell, we're both really tired of it. He knocked over an impregnable barrier at the bottom of the stairs and shot back up on his own, rather than let me carry him back up, and while I've been using my knees to lift, my back is Not Happy About It All. Next time I succeed in finding a shop selling a dog sling, or I borrow a bungalow. He (and my car, and someone not me to drive it) leave for home tomorrow, while I head off on in different direction for two weeks of Coraline promotional stuff. This is not a good thing, as all the things I was writing have come alive on me, all at once, and all I want to do is keep my head down and write them. 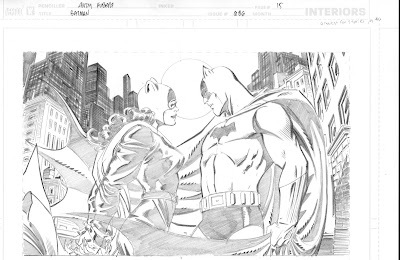 A few weeks ago I showed the pencils of a Batman/Catwoman panel from the last Batman/last Detective story I wrote, which Andy Kubert is drawing, and nobody told me to take it down. Herewith some of Scott Williams' elegant inks for the same panel, and a word balloon to boot. (Click on it to see it crisp and clean.) The first part comes out relatively soon, and Andy is frantically pencilling the second even as I type this. The miniature stop-motion animation set pieces and figures in this exhibit are shown courtesy of Henry Selick and the team of talented artists at Laika Entertainment. If you're in the LA Area, you might want to check it out. http://www.metropolismag.com/story/20090121/behind-the-scenery is a wonderful article on, well, Coraline behind the scenes. 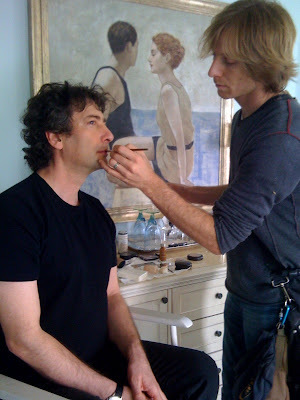 Is Neil Gaiman your cup of cup of novelty coffee? asks the Guardian, making the world wonder just why it's cup of cup of and not just cup of? And I find myself wondering what a Neil Gaiman coffee ought to taste like, and what ought to be in it. Probably not peanut butter, anyway. If any of you have ideas, twitter them to me @neilhimself (edit to add, use a hashtag of #coffee) or send them in to the blog on the FAQ line if they are more than 140 characters. For that matter if any of you run coffee shops, especially the kind that are also bookshops and want to try out Neil Gaiman coffee on innocent coffee-drinking humans, let me know. The short film we made of me (talking about an innocent article of clothing fastening) on Dec 17 will be released this evening, and I will link to it when it goes live. Meanwhile, I'm starting to get tired of carrying an 80lb dog (36 kg, 5.7 stones, and if he was distilled water he would be a bushel*) up and down stairs. Which I only have to do for a couple of days. I don't recall if you addressed when you set off on your trip, but why DID you take a convalescing dog with you? Wouldn't he be "better off" resting up at home? Couldn't whomever was left at home (Lorraine, Maddie or anyone else at Chez Gaiman) taken care of him? Actually, it was because of him I hit the road. He'd just had ACL surgery. It was minus 20F outside at home, and getting colder, and he had a shaved back leg with a freshly stitched incision on his back leg, and taking him outside to pee was starting to seem like an act of cruelty. tells the story of his visit to the vet, and his return at http://lorraineamalena.blogspot.com/2009/01/warning-wound-pictures.html. * I know. Volume not weight. Please don't write in and tell me. It was a joke. It wasn't even a good joke. 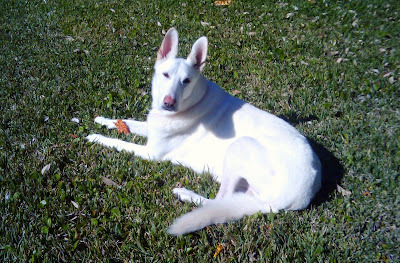 Do not waste the time you could be spending to make the world a better place telling me why my dog is not a bushel. There is no cellphone signal where I am, which makes finding a mislaid cellphone more or less impossible. Sigh. 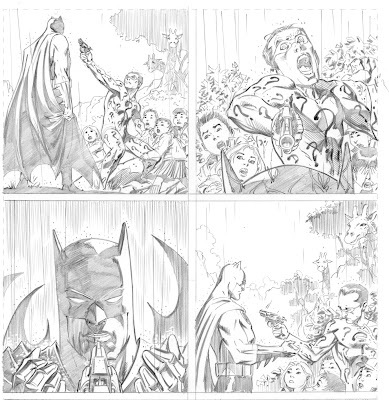 Phoned in all the lettering corrections on the final issue of BATMAN. I asked the impossible of Andy Kubert and Scott Williams, and I think they gave me what I asked for better than I could have dreamed. I can't wait to see the last issue of DETECTIVE. I am now on a carry-an-80lb-dog-up-and-down-stairs-four-times-a-day Workout Plan, because I cannot persuade Dog that newspaper on a balcony is something that he could use as a toilet. He says it's grass or nothing. He's actually being remarkably affable about the being carried thing. A new CORALINE web ad I've not seen before that feels, well, a bit more like the film than some of the other trailers I've seen. But mostly I just wanted to congratulate Kelli Bickman on the birth of her daughter, Isabella! Kelli is a very old and dear friend of mine and my family's. She's the artist who painted the amazing mural in my bedroom. Also you should now buy a painting from her, so she can buy the baby, er, whatever it is one buys babies. A microscope, probably. Or an anaconda. Happy and wise, in our giant hologram. Also, I am a coffee. Yesterday was sort of washed out post-drive. But I slept last night, and am getting ready to get some real work done today. You wouldn't know when exactly the Coraline movie is releasing in Australia, would you? Is the Feb 6th release date worldwide? I don't, I'm afraid. I know it won't get to the UK until the beginning of May, as we're trying to work my schedule so I can be there for the UK launch. I just thought that the Portlanders interested in going to see the Coraline premiere should know that the tickets go on sale on January 28th at 12:00pm. They're sold through the NW Film Center at the Portland Art Museum. Evidently there will be signs. 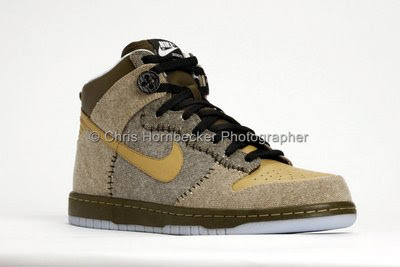 No idea what the price will be, but hopefully they won't be $250. Thanks, and hope to see you there. Here's a link with information on phones and box office times. It looks like the tickets will be $50 each. I thought it was strange that Lisa Snellings, who had once turned me into a Rat, had now turned me into a poppet-pretending-to-be-me (The original is for auction at http://tinyurl.com/npoppet and the regular edition at http://tinyurl.com/8jbdc9). But that was last night. I did not know what strange was. This morning I woke up and found I was now a peanut butter coffee. You are a peanut butter coffee. Honestly Tita, having read your review, I just wish I tasted better. Still, I am now a java from Java, and must not complain. That time I told her the size I wanted and how much I could pay and left the rest to her. This time I told her I would like something happy and wise (and how much I would pay). And I left the rest to her. It's the best way to deal with good artists. We are living in a Giant Hologram, according to New Scientist. Stacey's bookshop in San Francisco is closing. The piano scores that appeared above Schroeder's toy piano in Peanuts meant something. I'm an English/Art student from Germany doing a talk about one of your works. I'm not contacting you in terms of thesis or term papers. All I dare to ask whether you would answer some general questions concerning Popular American Literature. We are doing a seminar looking at this kind of Literature, started with the dime novels and your work "The Sandman: Preludes & Nocturnes" will be the last to discuss. Instead of just presenting it, asking general questions and discussing your work, I thought it would be great add something like an interview with the author. My Literature Professor told me that you, as an author, probably wouldn't do such thing, however, I'm kindly asking you anyway. If this seems rude to you, I apologize. I'm really sorry. The reason I have a blanket "I won't do your homework for you, please pretend that I am dead" rule, is that if I spent the time needed answering questions, I would never get any writing done. You've got one and a quarter million words of me burbling away on this blog, and many, many interviews out there already. Research it. Right. Breakfast and put pills into dog and then work. At one point yesterday evening I found myself talking on the hands-free-bluetoothy-practise-your-shouting-while-driving-phone to a friend who called to tell me he wanted to make me a bit-part murderous monstrous creature in his next movie. I have never killed anyone in a film before and realised at the moment I was asked that this is definitely one of those things I need to do before I die, so I said yes. (If anything ever comes of it I will report back here.) He was thrilled and I was thrilled. "This is the best possible conversation anyone could have," he said. "The only way it could be better is if we invented a new ice-cream flavour that everyone's been waiting for without realising it," I said, and waited for inspiration as to the nature of a new ice-cream flavour that would be nice and necessary to strike, but it didn't. The first part of the drive contained some beautiful/scary moments: blowing snow turned roads into slow white rivers that would occasionally erupt into something like steam or smoke-whirls on Neptune, that blinded then glittered like mica or diamonds when it hit the sunlight. Sometimes the road writhed with white snow-snakes. I kept driving -- pulled the camera out once, when it got less scary somewhere in Northern Iowa (with windchill minus35) and took http://phodroid.com/a6y4w4. The best bit of the drive was that the dog (who is convalescing from hind knee surgery) was forced to just lie down and not do anything else for two days, which is very good for his leg. Got to my destination about half-past midnight, covered in dog hair and smeared with cream-cheese from an early-morning attempt to give the dog his medicine that, in retrospect may have failed less because of the cream cheese and more because my hands were so numb with cold. Got on line. Learned that this blog was voted Best Literature Weblog in the 2008 Weblog Awards, and was pleased. Even if it means I may now have to have a pie-eating competition with Jessa Crispin. (And I will now retire this blog from eligibility in future years.) (I just challenged her to sushi eating at Katsu next time I am in Chicago. She accepted. This could get really nasty.) Congratulations to all the winners, and to all the nominees. Are you going to teach at Clarion again, anytime soon? I am willing to bet that being accepted to Clarion is a one-time thing. Also, as much as I admire other artists in the field I would love to have you as a mentor. So if you are planning to attend Clarion as a mentor again, say next year, or the year after, I am willing to wait to submit until then. But I can promise you that waiting for me would be the wrong thing to do. If you want to do the astonishing writers' boot camp that is Clarion, start applying: head over to http://clarion.ucsd.edu/... there are less than 20 places and hundreds of applicants. The application period is open until March 1st. It Will, as they used to say on the covers of self-help paperbacks, Change Your Life, but that's because it's Clarion and you're going through it with another seventeen people over six weeks, and not because of a specific instructor. Much to my delight and bafflement, The Graveyard Book is now in its fifteenth straight week on the New York Times Bestseller list. And the noise around the Coraline movie means that Coraline the book is now selling enough copies that it may go back onto the list as well. This is really fun. Someone sent me a link to Charlaine Harris's blog entry for Jan 11th, and all I could do was think, yup, I know how that one goes. Sometimes I think that ideas float through the atmosphere like huge squishy pumpkins, waiting for heads to drop on. I remember back in 1989 Terry Pratchett and I plotting a novel once about a serial killer who kills serial killers, and we had most of the pieces in place, and then both of us realised we'd have to actually write it, which seemed like less fun than making it up, and so we left it. I would have put him in the Serial Killer's convention in Sandman, but he just didn't fit. And I was pleased when I saw the Dexter books that that pumpkin had finally landed on the head of somebody else, who wanted to write them. Sometimes you're just lucky that the pumpkin lands on you first. But the truth is, it's not the idea, it's never the idea, it's always what you do with it. I remember Jonathan Carroll telling me to "Write it new", when we talked about how I had thrown out a whole Sandman storyline on reading Bones of the Moon. And I'm pleased I went back and wrote A Game of You. Charlaine's Cemetery Girl, if she writes it and I hope she does, would be different in every way from The Graveyard Book, because that's how it works. The Jim Henson Honours list for 2008 has been announced. Oh all right, Honors. And the strange thing is, that if I grumble about it here, then that gives someone editing the Wikipedia entry something to link to, and thus it will be fixed. Until someone finds a link to something that got it from Wikipedia in the first place, and changes it back. Just looked in mirror, and was suprised to find that after only two days of driving, unshaven, and with barely any sleep, I look sort of like a homeless person. This is just wrong. Luckily, I have a limping dog who thinks I am cool. SoI shall shave, and then drive off to stock up a larder with food, and find a car wash (for my car is thickly encrusted with salt), and call in the lettering corrections on Batman, and get on with my day. Just seeing if I can now blog from the G1, and I can. Well, I can if this posts. No more shall I submit to the tyranny of 140 characters. Unless I want to, of course. Cabal's left hind leg is shaved, and has a stitched-up incision. It's so cold outside that he's whimpering when I take him outside to pee; it's so cold outside that it hurts to breathe. And I'm way behind on deadlines. So I'm going to put him in the car and drive south, until I get somewhere it's warm enough for a sick dog and a grumpy author. I think it's a good bet that I'll be off blogger, twitter, and probably even email for at least a few days. ...and the School Library Journal has done an article on all the various versions of Coraline currently out there. The problem with deciding to lie in a downstairsy sort of a bed and do email, because your clothes are all upstairs and you know the halls and corridors between where you are and your clothes are going to be cold for it is minus ten F (that's -23 C) outside and this is an old house, is that the email does not stop coming in as you're doing it, and I'm about five days behind anyway, and I'm starting to realise that I will not catch up and the day will be done and I will still be here, warm in my makeshift bed, tapping away on email. Lorraine just came by to tell me that the chestnuts I sprouted and planted in pots in the kitchen have started growing into small trees. My housekeeper followed her in to look at me in the puzzled sort of way you do when someone is in a bed that shouldn't really even be there at noon answering email. "I shall stay in bed for ever, answering email," I told them, amiably. "It's cold out there." Neither of them seems even slightly fazed by this. It's nice down here in this seldom-visited room. I can see the Amano Dream Hunters centre spread painting and a Barry Windsor Smith Sandman drawing on the wall from where I'm lying, along with several Lisa Snellings statues. Pretty soon now, I'm going to have to get up. I was very excited to hear that the Premiere for Coraline would be in Portland, OR. I was wondering when I'd be able to get my hands on tickets for the premiere? I'd really love to be the first to see it on my block. Absolutely love your work. You mentioned in a post that you would be attending Portland's International Film Festival for the screening of Coraline. Will you be doing anything else while in Portland (signings and such)? It would be great to see you. It's possible but not likely, because Laika and Focus (who will be bringing me in for the Premiere) will probably already have packed my dance card with press interviews. If someone with power over my schedule while I'm there decides that what they really need is for me to give a talk or a signing, then it might happen. But you're more likely to get an autograph on the red carpet, I suspect. Possibly, but I can't help feeling that declaring that they had to be wiped out, putting a bounty on each pelt, and then shooting them until there weren't any left had rather more to do with it. It was 1992, I was married to an American, we already had two children, and most of my income came in from DC Comics. It was a bureaucratic and irritating process to get a Green Card, but not actually difficult. How do you prefer your cup of tea? Not Earl Grey. If it's a black, English breakfast-style tea, then made with boiling water and, once brewed, with cold milk added. If it's green, sencha, or something else, just with hot water. Because there's a lot of honey around here these days (see beekeeping posts for details) if I use a sweetener it's honey, but usually I don't bother. Lorraine just reappeared holding a plate. "Breakfast for today consists of lightly stir-fried oriental vegetables topped with an egg," she announced. "I presume sir will be taking his breakfast in bed...?" Apparently sarcasm works incredibly effectively to get me out of bed. In case you were wondering. I sighed, got up and rejoined the world. Edit to add: If anyone at LJ can solve the mystery of why it's suddenly taking somewhere between five and ten hours for the syndicated feed to appear on LJ, the webgoblin and I would be much obliged. In the old days the LJ synd was a good way to find out if I'd put code in that had broken the RSS feeder -- if it didn't show up, I had -- but now it just seems routinely to take forever. ...poor thing. He won't be able to go up stairs for six weeks, or be allowed to run. Meanwhile, there's a photo of him, and me, and snowshoes from the other day, at http://twitpic.com/107mi. And James Vance sent me a link to his blog that I wanted to pass on. I feel guilty as I don't post all the appeals for help that come in to the blog, mostly because if I did each blog post would contain a link to one or more appeals for people who need medical or other help... But I post some. And they make a difference. The black Coraline keys around, is it true that if you have one you can participate in a scavenger hunt? or are they just something cool you can collect? I don't know. I'll ask. I suspect the "scavenger hunt" thing may have been made up by someone selling them on eBay, though, as no-one has mentioned it to me. The impression I get is that they are simply mysterious keys that sometimes appear on walls. Yup, I checked. The keys are just keys. No competition there. The fake Coraline box Other Mother doll was taken down from eBay, and the person selling it seems to have vanished too -- seeing that he had a few "he took my money and never sent me anything" complaints on eBay, I do not think he's a great loss to the world of online retailing, and will probably be back there soon enough under another name. Huge fan of Coraline here. I didn't get a mystery box, unfortunately. But, I didn't want to miss out on the excitement, so I created my own handmade fully-articulated Coraline doll. Lovingly hand-made with kitchen gloves for the raincoat and boots, do-rag for the skirt, beenie baby for the pink top, knit sock for the stockings, twist-ties for the boot bows, blue paper for the hair, lots of super glue and of course, buttons for the eyes and raincoat. Thought I'd share. Happy New Year! ...although mysteriously, according to the Evil Buttons blog, which seems to be keeping track of all things Coraline (so I don't have to) this doll seems to have also been offered for sale by the person selling the Other Mother doll, not as something recently made but claiming it "...comes as a trip swag from someone who went to Siggraph this past Dec."
Where is the teacher's guide to Coraline that I keep reading about? I can't find it anywhere...I plan on having my students (9-10 year olds) read the book in Lit Circles and then see the movie. Will it be rated PG or PG-13? We have restrictions in our district. Also, if I order copies of the books for the kids do I want the regular version or the movie tie-in version? Thank you for the reply...just trying to prepared for the February release. http://www.popmatters.com/pm/feature/67364-popmatters-best-of-books-2008-fiction is a terrific Best of the Year round up, and what the reviewer said about The Graveyard Book made me happy. I was wondering what fountain pens you're using in this picture (I didn't take it--just stumbled across it). I am guessing that it is a Namiki Falcon and a Lamy Accent on the table. It's seriously been plaguing me. Thanks a lot!!! Spot on. For some reason, most of my pens skipped badly on The Graveyard Book, but the Namiki Falcons worked. That one held up valiantly and then the nib died after a heavy bout of signing in Chicago, and I never really replaced it. Someone sent me a link this morning to an eBay auction that claimed to be of the contents of a Coraline Box. And as far as I can tell right now, it's a fake thing (still waiting to hear back from the studio), in that it's not a costume from the film and it's very obviously a home-made doll. How odd. Too many FAQ line questions stacking up: I'm getting close to the point where I'll do a massive answering of stuff, I think. You're more likely to get a question answered if it's actually a question, and if it's short, and if it's answerable, and if I feel like answering it. Several people misread the last post, and assumed that I was saying that Paterson Joseph was the Doctor and I was somehow disappointed. No, I was saying that Matt Smith is the next Doctor and that Rich Johnston had somehow got it wrong. The new, revamped WEIRD TALES is doing a bunch of stuff about me and Sandman on their website (and they have an interview in the next issue of the magazine). There's a nice description of what it was like backstage at The Graveyard Book reading in Seattle at http://weirdtales.net/wordpress/2009/01/02/neil-gaiman-an-appreciation/ by Lisa Mantchev. I am convinced that it was taken at my comeback gig after I got out of prison. Roy Orbison and Johnny Cash were hanging around backstage, playing Gin Rummy. "Aren't you going to come and watch me sing?" I asked them. "We've heard you sing," they said. "If you don't mind, we're playing a really exciting game of Gin Rummy here." Only the fact that I do not sing in public and have not been in prison (other than as a visitor and novelist) makes me suspect that I'm making this up. I mean, the camera doesn't lie. *The photo was taken by Pixie. Labels: alternate universe me, fake Coraline box?, honestly it's a good thing I don't sing in public, I do the weird stuff. As many of you learned from Rich Johnston's Lying In The Gutters, Paterson Joseph is definitely going to be the new Doctor Who. It even got a green light. But alas, for once, in an affront to decency and sense, Rich is less reliable than the Daily Mail. Admittedly the Mail printed their story after the BBC had announced the new Doctor. I'm a teeny bit disappointed about Paterson Joseph. But still, now it means if I ever wrote a story where the Marquis de Carabas met the Doctor... no. That way lies madness. Matt looks very at home in front of the TARDIS, though. And I trust Steven Moffat's judgment completely. So that's one less thing in the world to worry about.